I haven't died- we are just super busy. 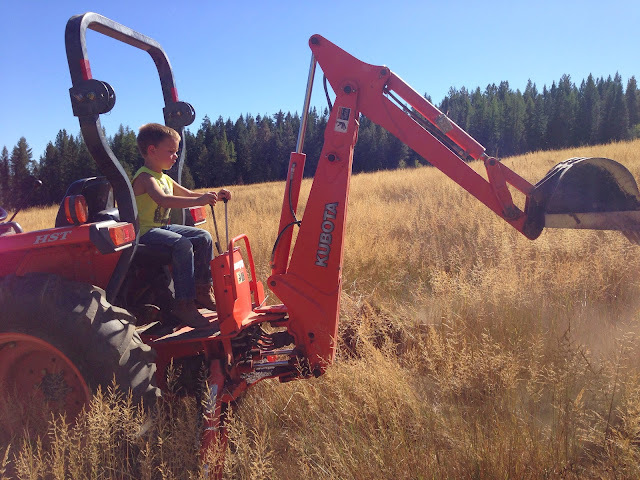 I spent 10 days in Idaho at my Father-in-Law and Mother-out-law's house. (They aren't married but she is very important to me.) Husband, the kids, and I always love visiting there. It's so peaceful. So relaxing. 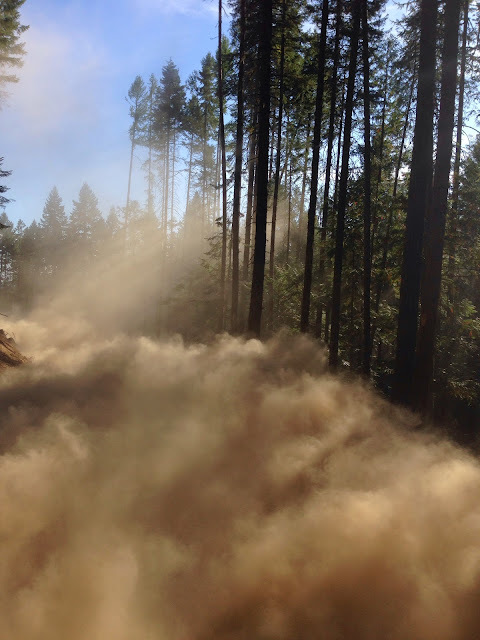 It's a bit dusty this time of year but it mmakes 4-wheeling that much more entertaining. Then 4 days after that we scooted off to Georgia for one amazing, extravagant wedding at the Ritz-Carlton in Greensboro- what a place! 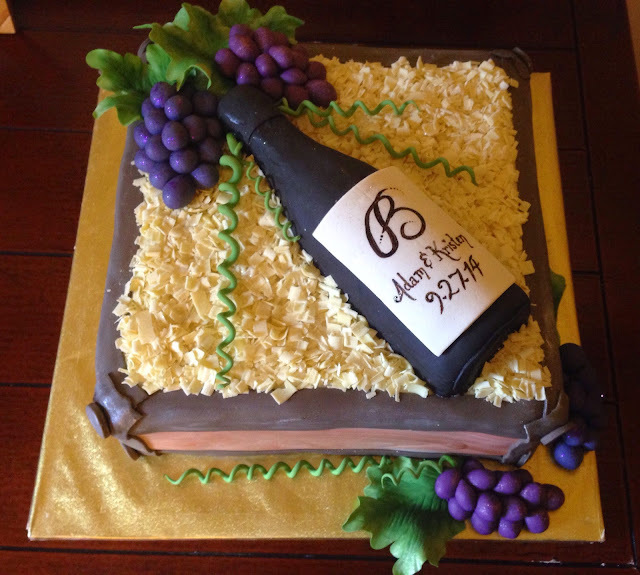 We had a wonderful weekend and the rehearsal dinner cake I made even survived the long drive! 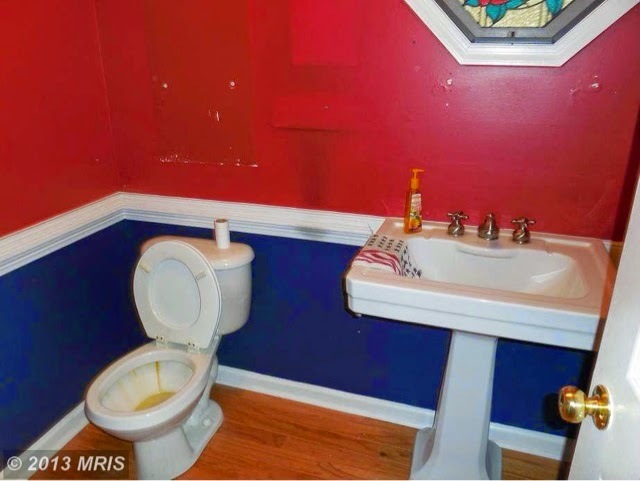 It's pretty likely that your first ideas of redoing a house don't happen after you've already closed on a fixer upper. It's likely something that's been a goal or idea of yours for quite some time. If you're like me, you've got a whole board dedicated to your perfect house on Pinterest. It's fun to browse other peoples successes (and sometimes even failures) to see what you'd choose if given the option. 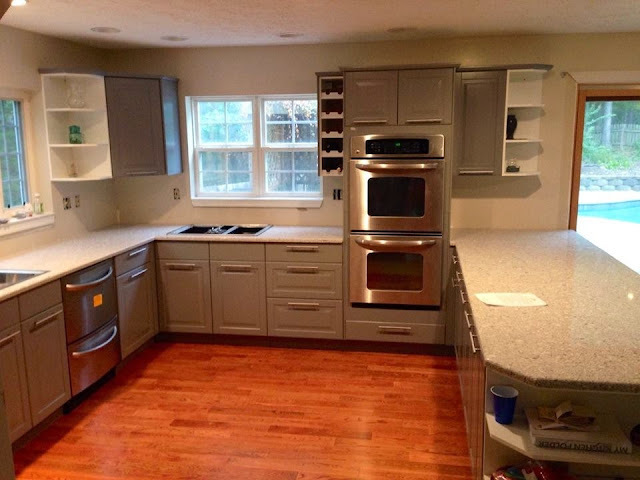 Expansive chef's kitchen? Check. Giant timber frame living room with towering windows? Check. 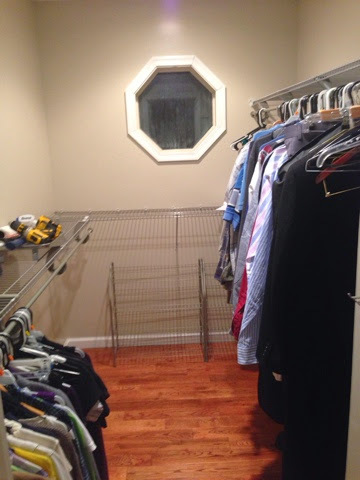 Perfect little built-in reading nooks? Check. Lazy river in the backyard? I'll think about it. And then an opportunity presents itself and you have a chance to actually redo a house. Now what? While you're waiting for documents to be processed, and filed, and shuffled, and passed onto the next person, and refiled- you hop on your trusty idea board. That giddy excitement is instantly replaced by fear. All of a sudden I realized I had 14 very unique kitchens pinned. On top of that I had 7 master bedrooms, a handful of bathroom plans, and a literal ton of grand living rooms. None of it seemed to go together. 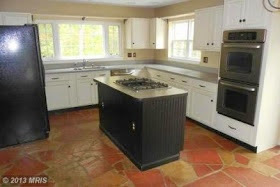 In Lala Land it's ok to have a farm kitchen, rustic lodge living room, modern bedroom, and French provincial bathroom. But that's Lala Land. As fun as it seems it would be to hop between time periods and countries when walking around your house, it just wouldn't work in real life. There would be no flow. I'm big on flow. So I had to narrow it down. Way way WAY down. I started with the general basics. 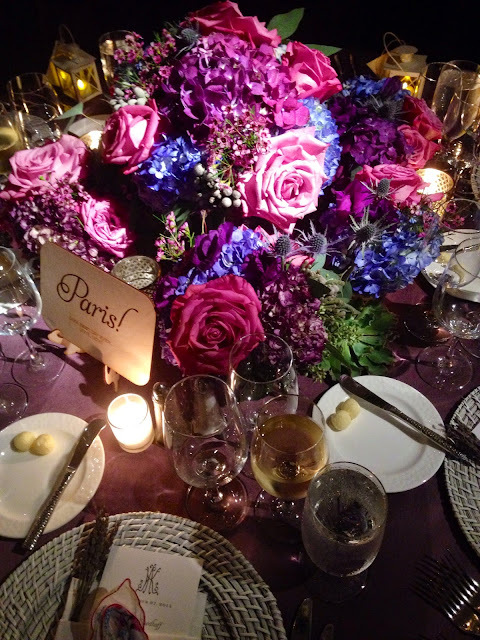 What was my favorite color scheme- something muted with a bright accent. Did I want warm or cool- warm, cozy, and very welcoming. And then I remembered a little jar I had packed away when we moved. It used to sit unassumingly in my old kitchen. It never matched anything there and yet I loved it. It was an old blue Ball jar with sea glass in it. So I dumped the sea glass out onto a plate and picked through it. I chose these pieces to base my house around. The center stone is my wall color. It reminds me of sand in the shade. Just to the right of that is my counter inspiration. I pulled the brushed silver color out of the far right rock for metal necessities (drawer handles, outlet covers, that kind of stuff). 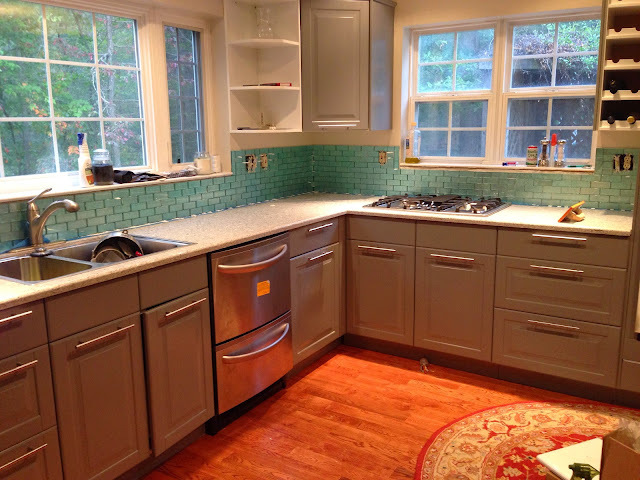 The blue rocks are my bright accent- my backsplash and pendant lights. Finally, the far left rock- it got a free pass to stay just because it's pretty. A little extra pretty never hurt anything. 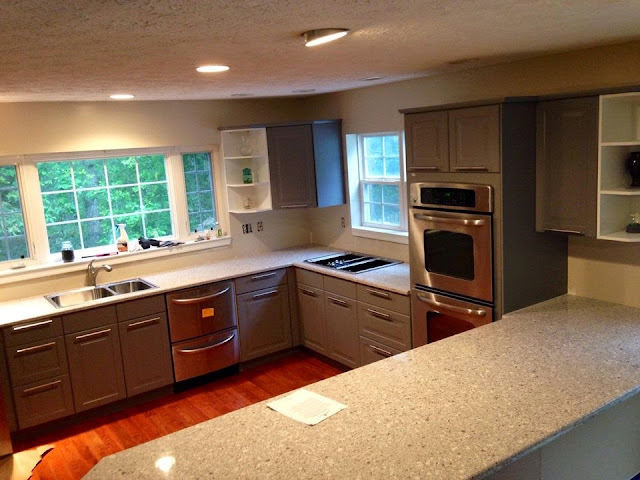 When searching for my exact kitchen choices, I fell in love with my counters before my cabinets. I originally thought I'd go with a gray washed cabinet to mimic driftwood. Well we aren't on a beach and we didn't buy a cabin. Too beachy seemed cheesy. I went with the modern gray. 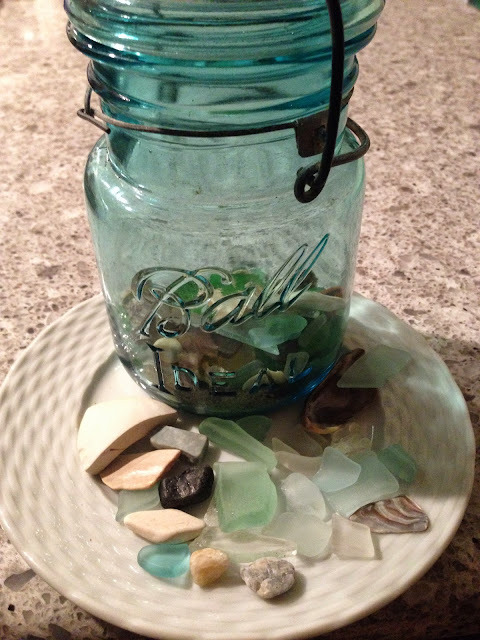 If you didn't 'know' the kitchen was based around sea glass in a vintage jar, you would probably never guess it. And yet there it is- just like the seaglass. 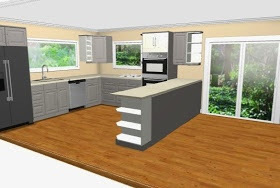 So here is the kitchen with the counters, cabinets, and wall colors. It's beyond my expectations. My peninsula has a 12" deep, 10' long breakfast bar. Finding stools is a challenge- but I'll track them down eventually. 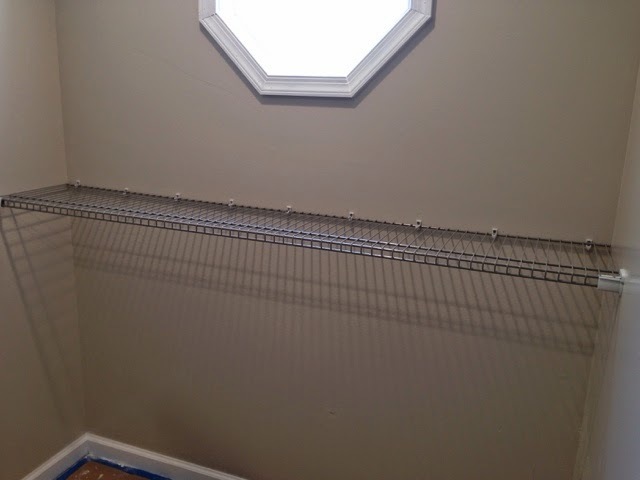 I still have to paint the trim, tile the backsplash, and make/ wire some pendant lights. Sadly there are only 24 hours in a day, the kids need to be cared for, and I do need sleep. Life's not always fair. 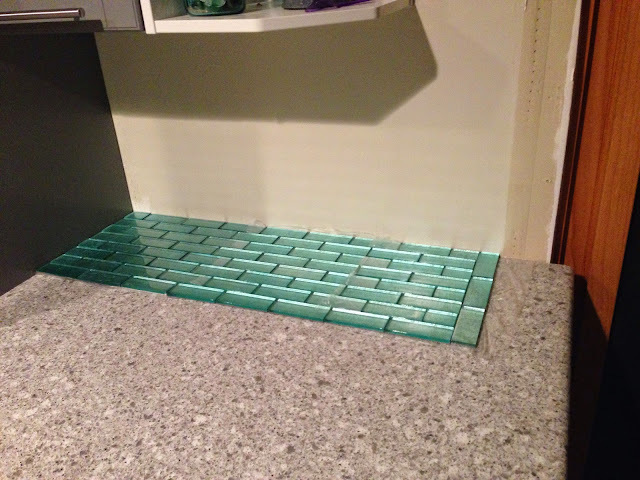 It took me the better part of a month to track down my backsplash tile. 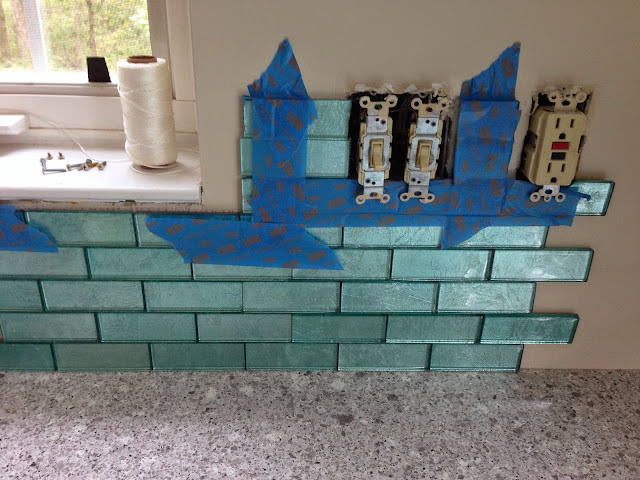 I knew I wanted smallish subway tile. I knew I wanted them to have a crackly ice effect. I knew they had to be Mason Jar blue. I had a vision that didn't exist. 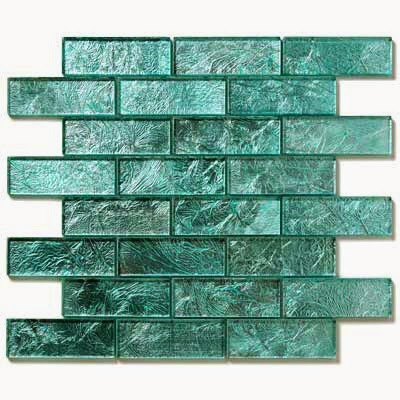 In my searching I found Solistone Juniper subway tile. It fit everything except my color. All the pictures of it looked like a deep teal- too dark and too green for my vision. A couple weeks later I had no better options and decided to order it anyway since I kept thinking about it. 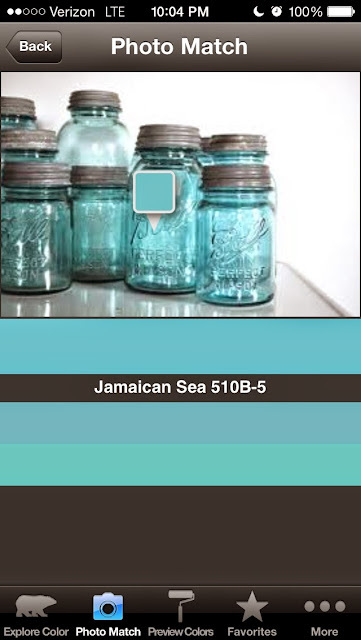 I would tint some mason jars to match and make it look like it was my intended color. I had a plan. My stone arrived in 2 small boxes that were shockingly heavy. I opened them up and the tile was perfect. I couldn't have asked for a better Mason jar blue color! The pictures online were very deceiving. Had I been anticipating the color online, I would have been disappointed in what arrived. However, in my case, this was one extremely happy accident!!! I was giddy. I called Husband and informed him I intended to make babies with this tile. I loved it that much. 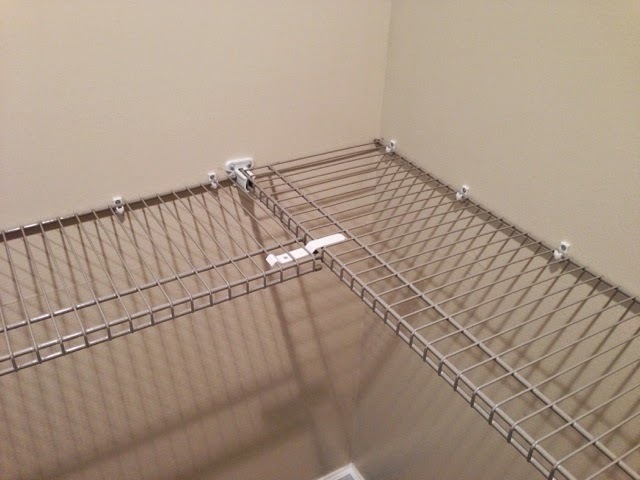 Like many options on the market, my tile came in neat 12" square segments held together with mesh. Instead of laying each piece one by one, you can slap up a whole bunch at once. 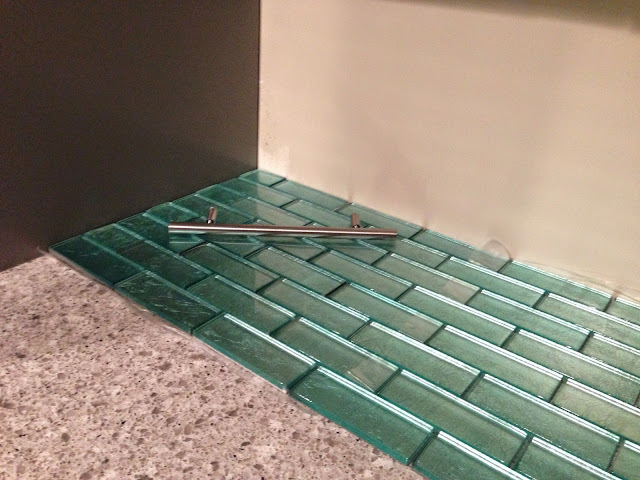 Instead of evenly spacing every.single.tile individually, you just have to adjust the gap between large sections. It's much faster and the final result is just as appealing. 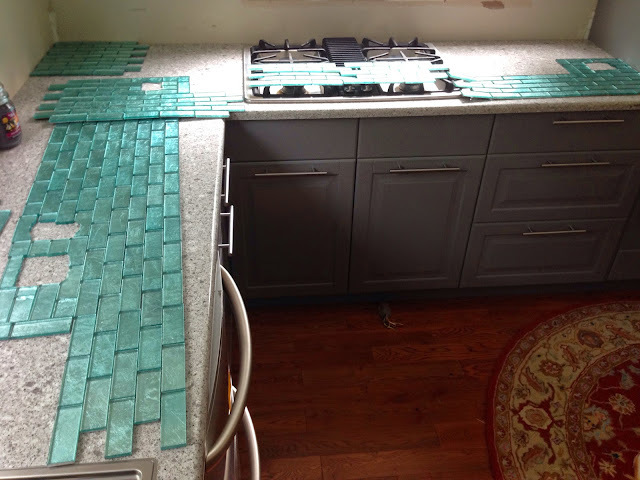 I laid out each section and cut the tile to the appropriate size. 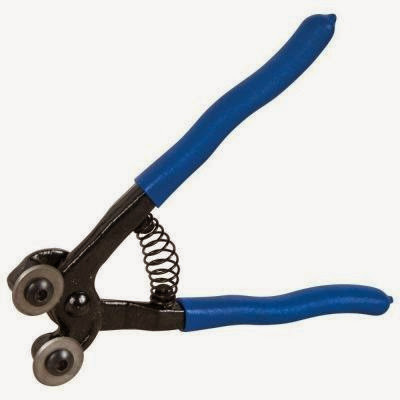 I used a pair of glass tile nippers like these to cut some of my pieces in half and trim edges around outlets. But I learned it none the less. 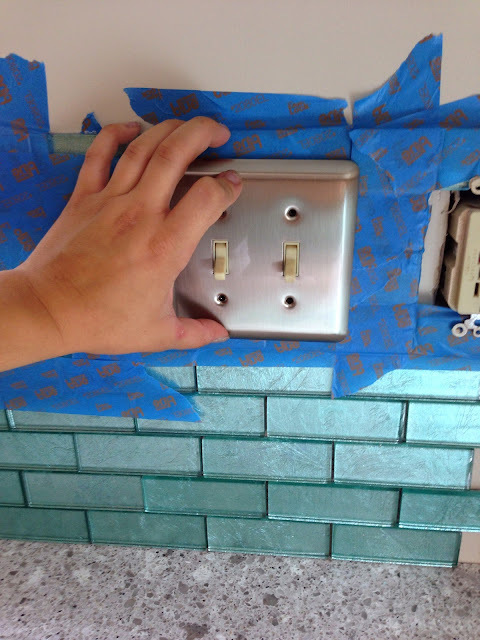 When it came time to put tile around the outlets, I began taping the cut tile to the wall to test fit them. 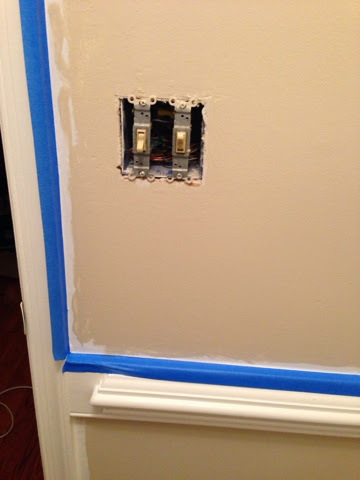 Speaking of outlets, make sure you turn off the power, unscrew the switches/ outlets, and pull them out of the wall! They need to rest on top of the tile to allow your covers to fit properly. 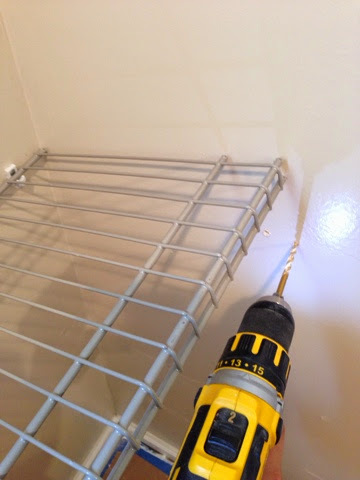 I cut the tile away from where the screw holes are so that I wouldn't have to drill through the tile later. The tile nippers I bought cut through the tile with ease but the edges were left pretty jagged. I hid my raw edges behind outlet covers wherever possible as it looks like I hired a rabbit to chew them to size. 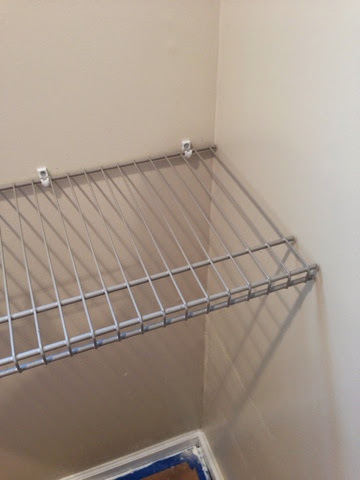 Tomorrow I can grout it and put on my brushed stainless outlet covers. I ended up with 3 sheets of excess tile. I am toying around with where to use it and I think I'm leaning toward framing them and hanging them in the attached dining room to pull the blue into there. 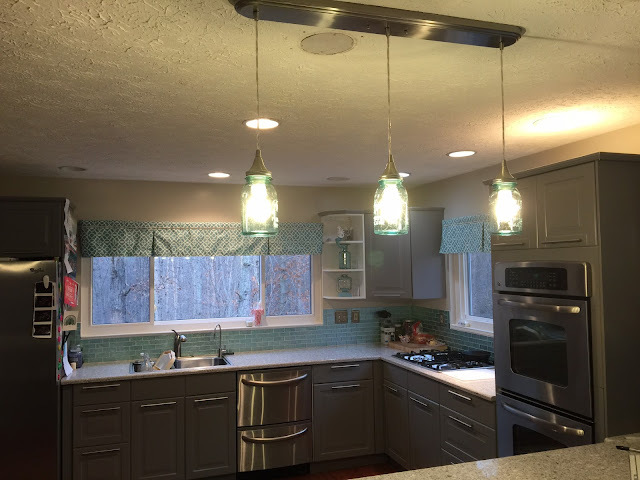 I wired some vintage blue mason jars as pendant lights over the peninsula and made curtains. Here are a couple pieces I've found that match so wonderfully. And I got 2 cool counterheight benches to put at the breakfast bar. Very.... Patriotic? You can't see it in the picture but the wall with the door in it is cream and burgundy gingham wallpaper. I love America- but when using a restroom I prefer a spa-like atmosphere to the Star-Spangled Banner. 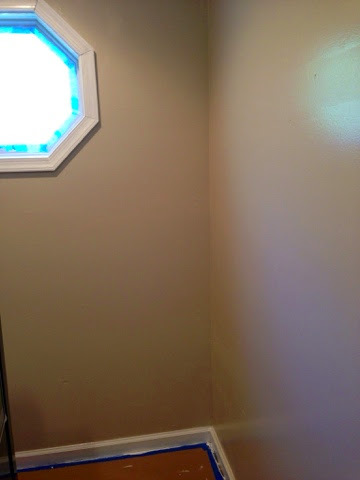 To get this place turned around, I painted all the trim white first. I overpainted everything. My light gray beige (greige?) wall color will easily cover the extra white and I only wanted to tape the trim once. Then I caulked. 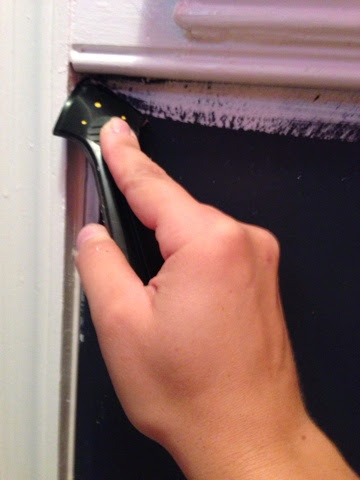 You basically squeeze a bead of white bathroom caulk along all the trim and use a handy little rubber corner tool to pull it into a perfectly smooth surface. 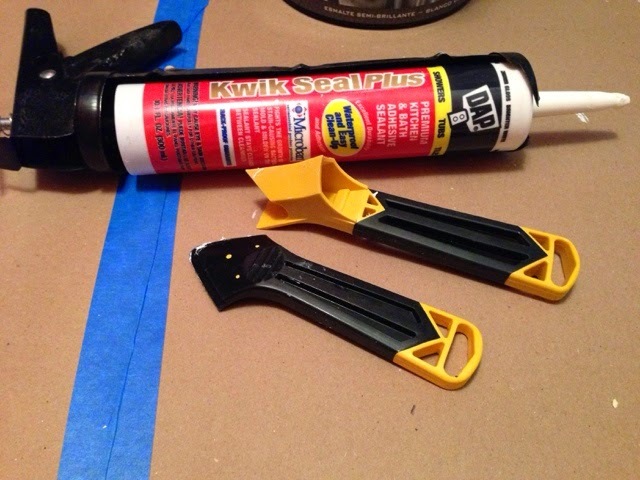 There are other ways to caulk but this is ridiculously fast- and cheap! This was my arsenal. 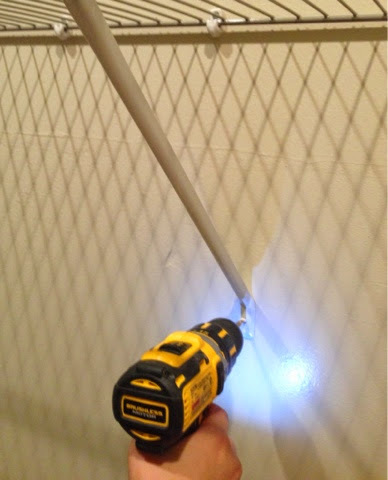 Mildew resistant white caulk (it is a bathroom afterall), a caulk gun, a sharp tool to remove old caulk (I barely used this as the old caulk was so old it basically fell off when I gave it a dirty look), and my caulk spreader. And after it was smoothed. 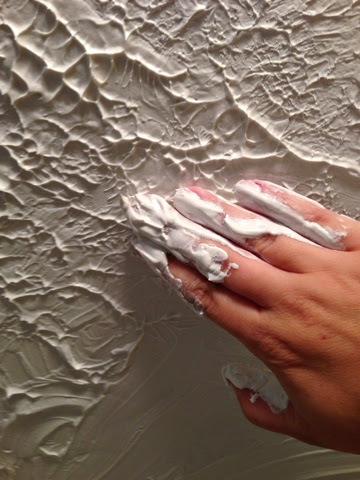 Once the wall is painted you won't see the feathery edges. Then I painted the walls. 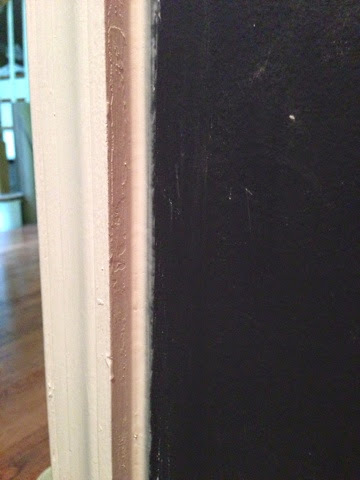 The Behr Premium Plus paint I used covered the dark walls surprisingly well. 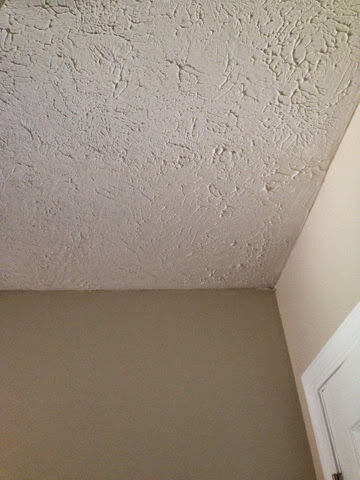 I rolled on 2 coats of the paint leaving a gap near the corners, ceiling, and trim. Then I taped everything off and used an angled paint brush to edge. 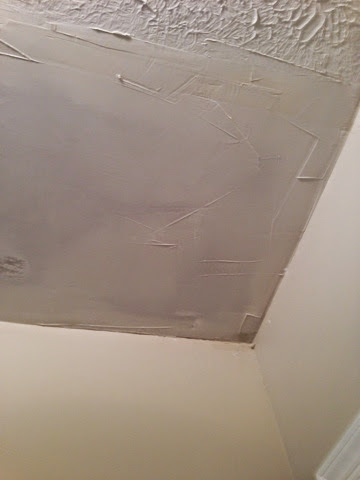 I put a thin layer of my drywall mud over the whole thing. 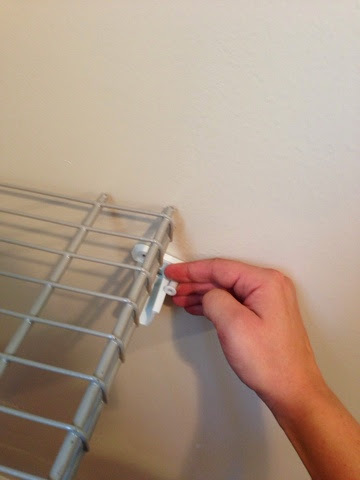 It's the same stuff I used to patch all the holes in the walls. I didn't worry about getting it perfectly smooth as I was about to mess it all up anyway. 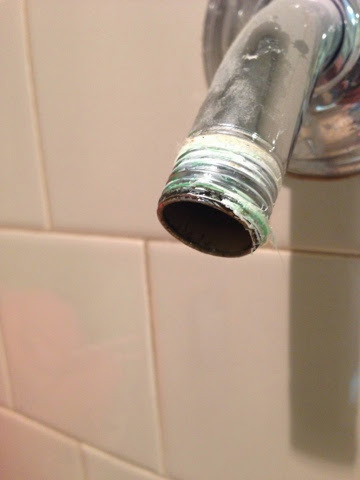 The mud was way too thick the way it was so I decided to add some water to it to get it to a drippier consistency. That's what the texture reminded me of. It looked like thick waffle batter when I was done adding water. I used paper and plastic instead of real dishes so that I wouldn't have to wash them out. This stuff makes a mess- you've been warned. I tried to apply it with various sponges and tools I found laying around and nothing seemed to get me even close to what I was looking for. 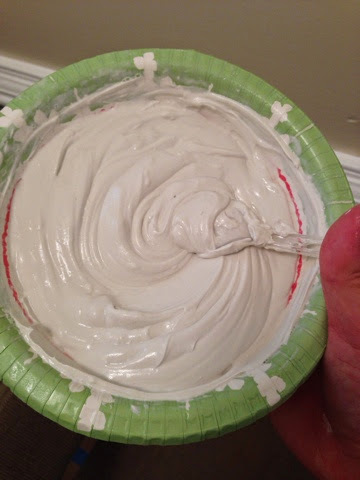 I accidentally put my hand in a bowl of icing one time and the texture looked exactly like what I was aiming for! I had nothing to lose so I went for it. 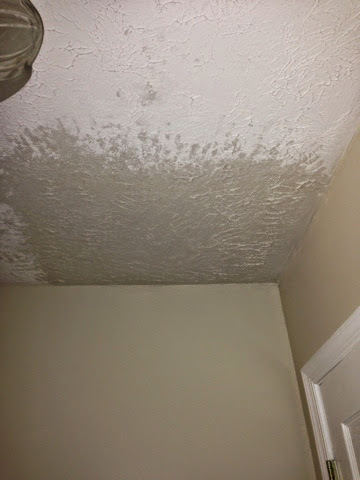 I glopped a whole bunch in my palm and smeared it onto the ceiling. Then to get the texture I pressed my hand into the wet, soft mud and pulled it straight down- the result was perfect!! Here it is when I was done but before it dried. I feathered it out into the existing ceiling to blend the textures and blur the lines. I have yet to paint the ceiling but it's great as is for now. Once the paint dried I just felt the room needed a bit more oomph. Some more class. 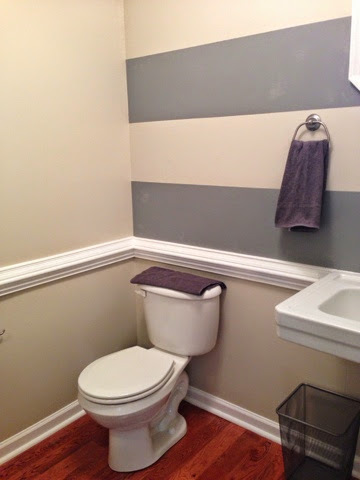 I decided that the 2 long walls needed thick gray stripes above the chair rail. 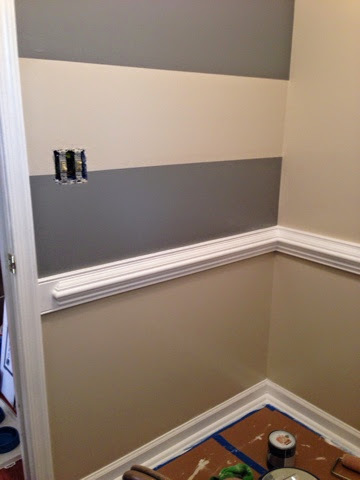 I plan to do the same stripes in the dining room anyway. This would be a good trial run and a way to tie them together. This room, as opposed to my large dining room, would be easier to repaint if I hated them. Then came the math. I knew I wanted 5 stripes. The space from ceiling to top of the chair rail was 61.5". 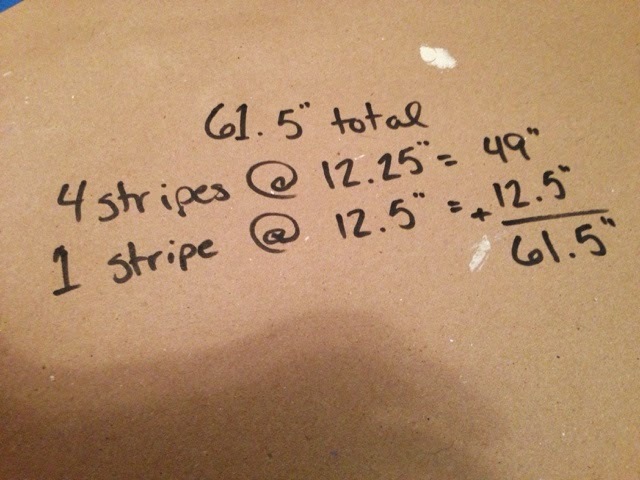 61.5"/5 stripes= 12.3" per stripe. My tape measure doesn't have accurate .3" markings so I decided to make the highest stripe a hair bigger to leave me with nice easy numbers. The top stripe would be 12.5" and the other 4 stripes would be 12.25". Almost no one could recognize a ¼" difference in such wide stripes. 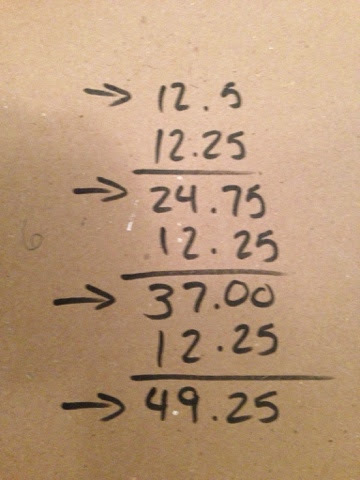 To tape out the stripes I needed to know where to measure from. Always measure from the the same place for each measurement. Unless you're in the middle of an earthquake or some other major disaster it's highly unlikely that the ceiling height or floor height will change on you during taping. On the other hand. You could slip and mis-mark a stripe and not realize it until it's too late. 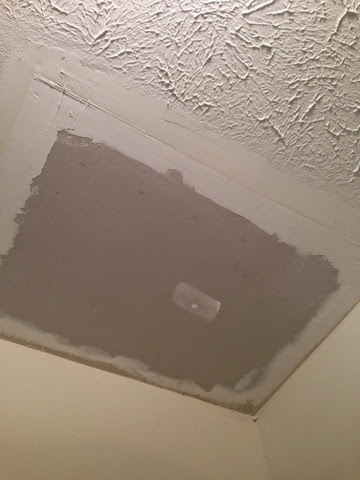 I marked the bottom of the first stripe at 12.5" down from the ceiling. Then the next stripe would end 12.25" lower at 24.75" from the ceiling. The 3rd at 37", the 4th at 49.25". The 5th stripe ends at the chair rail so no need to mark that. 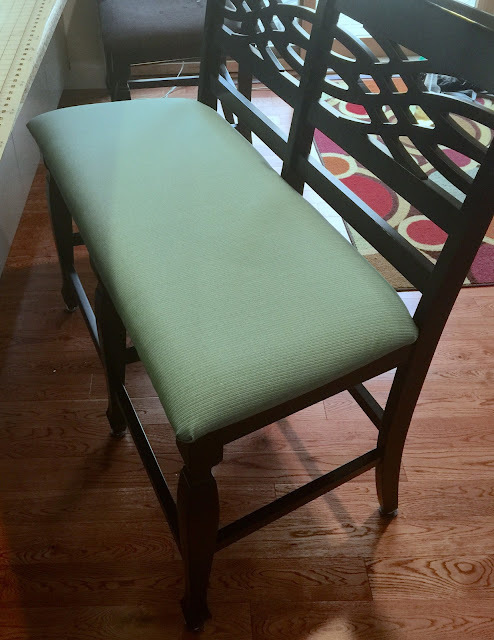 Once everything was measured, I did measure 12.25" up from the chair rail and hit the stripe mark perfectly. Since everything was lined up, it was time to tape. 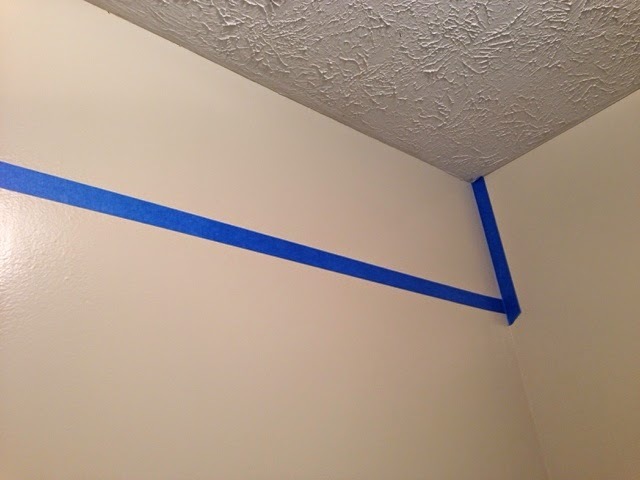 Remember to place your tape so that it's on the outside of the line of the stripe you plan to paint. 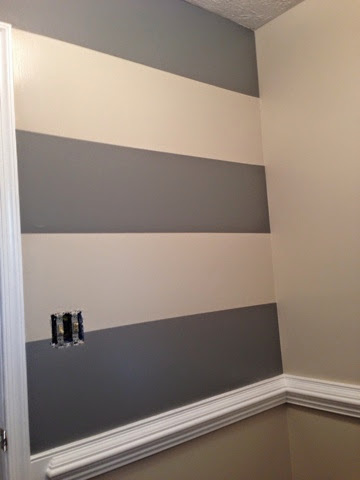 The greige stripes have the tape placed on them so they appear smaller during the taping process. I also taped off the corners so that I wouldn't get paint on the adjacent walls. 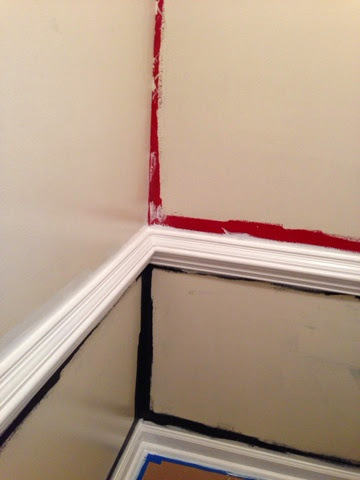 As soon as you finish painting a stripe, remove the tape! It's much easier to remove when the paint is still wet. Once it dries you have to score it with a knife or risk small pieces along the edge peeling up. They really add a nice touch against the gray. 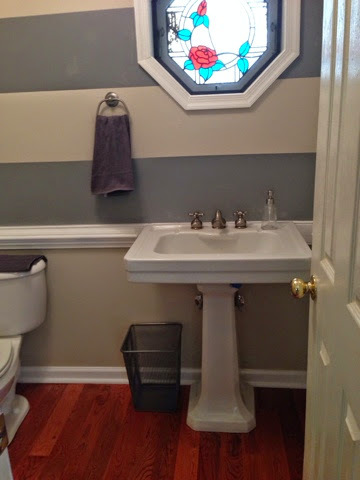 Over the sink is a window- so I couldn't put a mirror there. The only other place it could really go was on the wall opposite the sink. 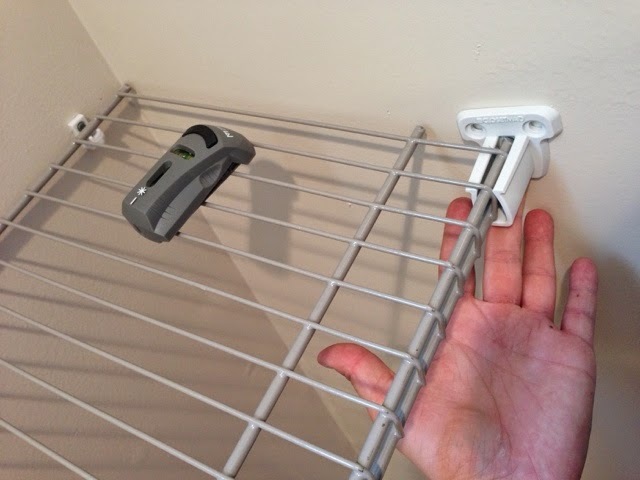 It works great in the space. I centered the mirror on the stripes and it's the perfect height. I was so excited about finishing that I actually snapped the photos before my gray stripes were even dry! 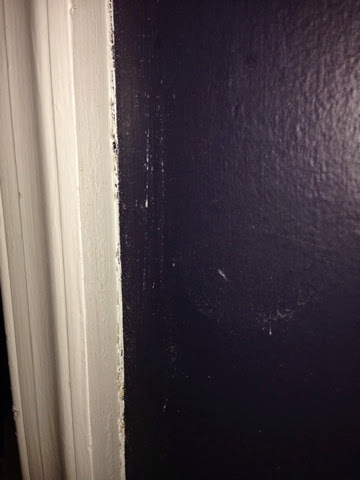 The lighter spots you're seeing on the wall is wet paint- Whoops! It feels amazing to have 1 room completed. 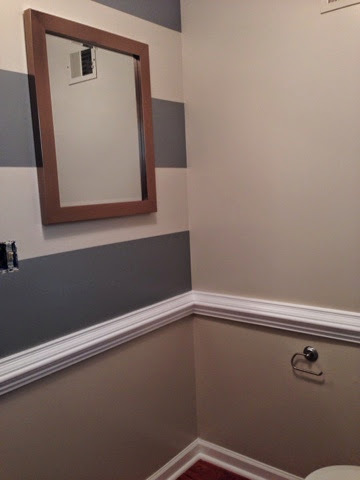 As unsure as I was about beige and gray stripes- they're perfect!!! Warm yet modern. 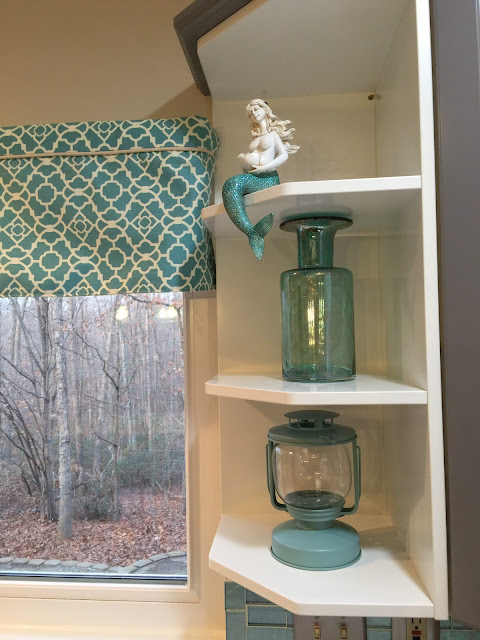 This color scheme will continue through much of the first floor with a pop of antique Mason jar blue here and there. 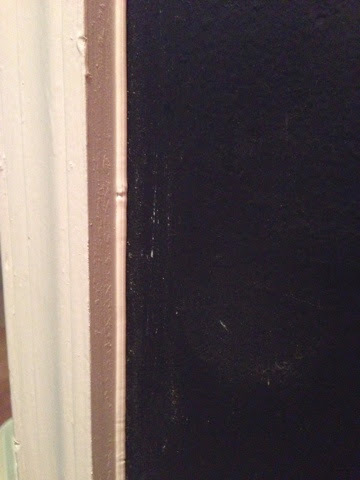 Behr makes an awesome color match phone app! You upload or take a picture, click on the color you want to match and it pulls up a matching paint color. 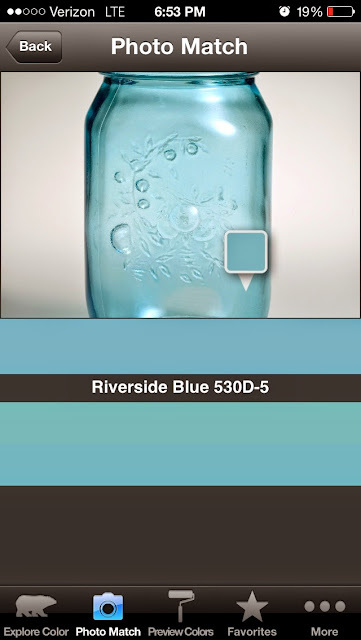 I found a couple of pictures of blue Mason jars online and used those for the app. Different jars gave me different color results depending on where I clicked on the picture- the thick highly pigmented rim, the wall, etc. Here are the colors I like best in the results. These are screenshots of the app. I'm leaning toward Jamaican Sea or Riverside Blue. 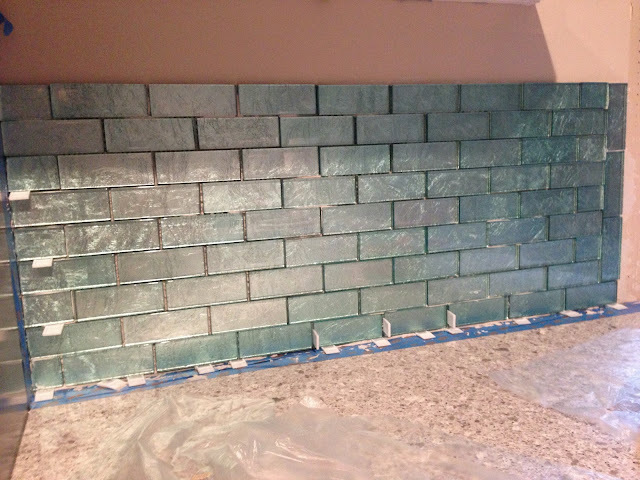 I won't do anything with this paint until my backsplash arrives. I need to make sure it coordinates with the blues in that. 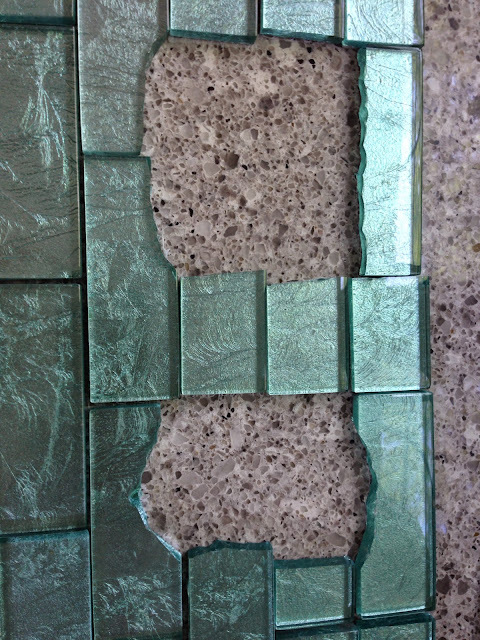 This week my countertops arrive!!!!!! 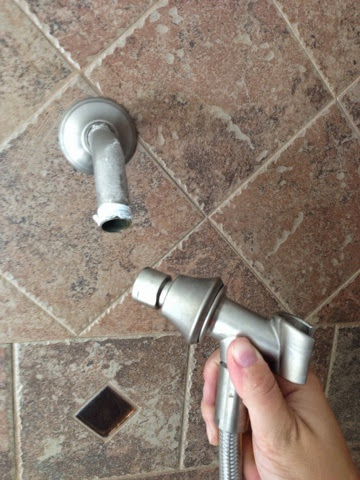 The company actually sent me an email saying they were done and ready to be installed but I'm currently in Idaho on vacation with the family. They'll have to wait a few more days. I'll return refreshed and ready to tackle cabinet painting- Oye! 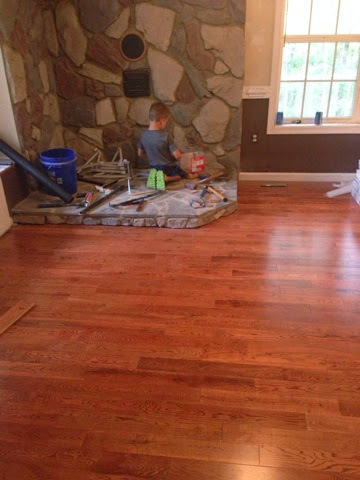 WE HAVE HARDWOOD FLOORS!!! They're gorgeous. I love them and want to make sawdust snow angles on them. Oh- and that's my son. He's the official tool sorter and retriever. To celebrate completing the first major hurdle, I decided to open a bottle of wine. But my wine opener was stuck in a random box, on the moving trucks somewhere between our old house and this new house. 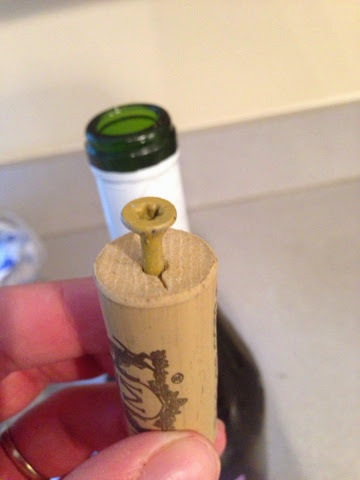 No worries- a long screw, screwdriver, and pair of pliers worked perfectly. "Necessity is the mother of invention." At this point I have no kitchen. None. I have an empty room with a 3" thick cement floor. In the meantime I need a temporary kitchen. 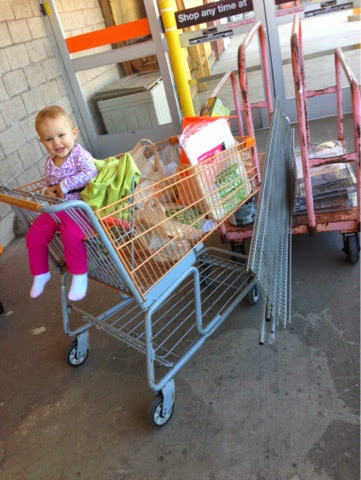 These are our favorite temporary shelves. They are cheap and hold a lot of weight. It's literally 2x4s and cinder blocks stacked up. I did put 2 layers of cardboard under the bottom blocks to protect my floors. 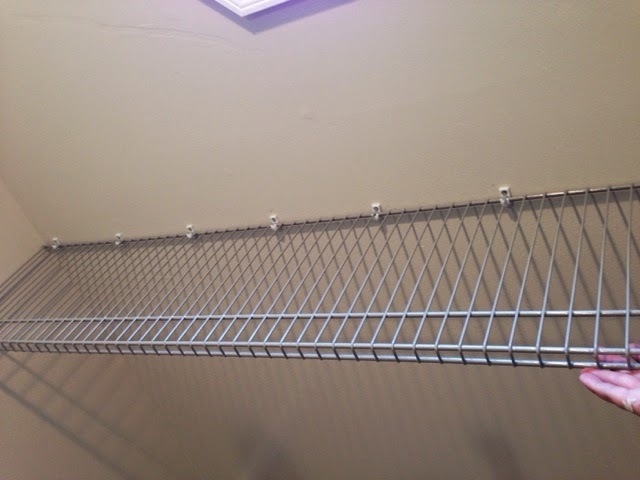 This is what it looked like after I removed all the old shelving and finished painting. 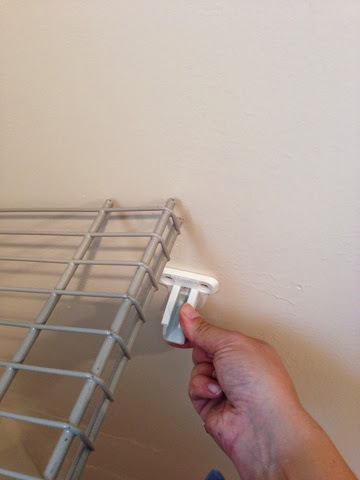 *pop the little end caps onto any cut edges of shelving and you're done! To support a corner they make these nifty supports that work great. 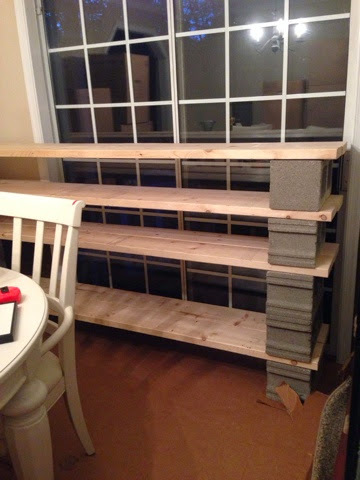 Just make sure your shelves are level and even. Then add the bottom supports, hooks for a hanging rod, the rod itself, and fill! 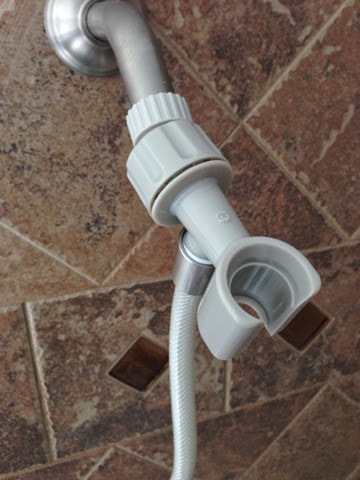 Then it was time to change out the shower heads. I insist on having the ones with the handheld sprayer. 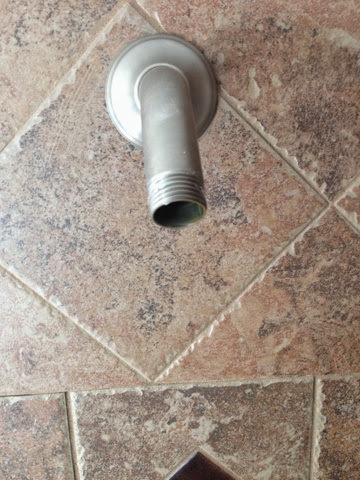 It makes rinsing the shower down after cleaning extremely easy. 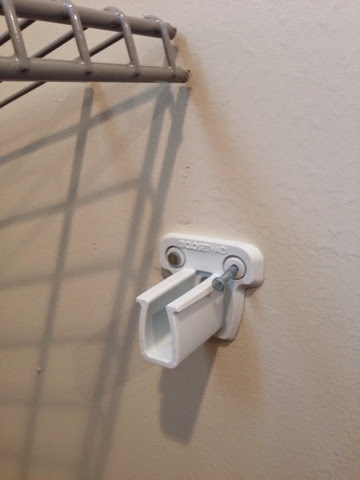 This is the one in the kids' bathroom. Pretty isn't it? And yes, that's a twist tie holding the broken clip together. Brother in law fixed it until I was able to replace it. 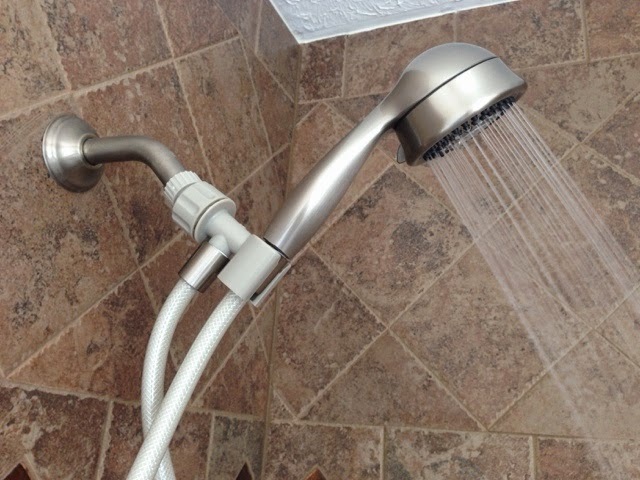 Changing a shower head is extremely easy. 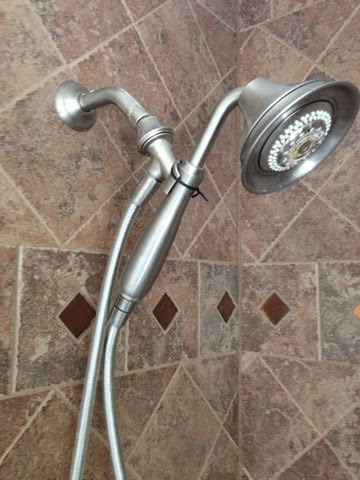 You literally unscrew the old one, remove the old teflon tape, clean, tape it up new, and screw on your new shower head. 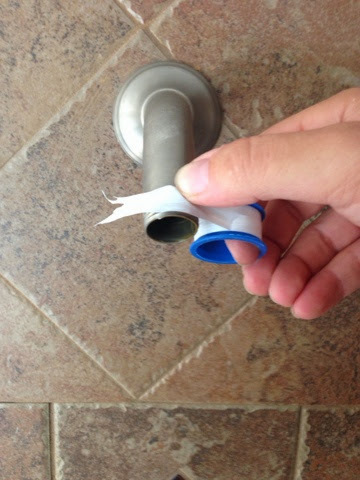 When buying teflon tape, the white color is made for water use. Different colors are meant for other uses (like gas lines). 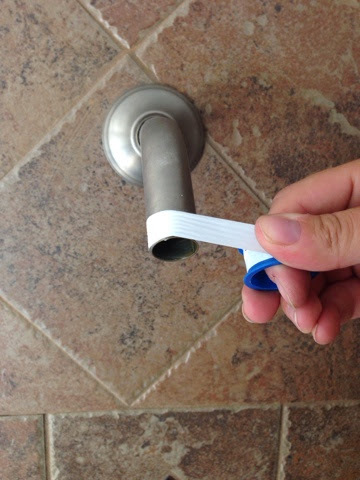 Always tape in a clockwise motion! 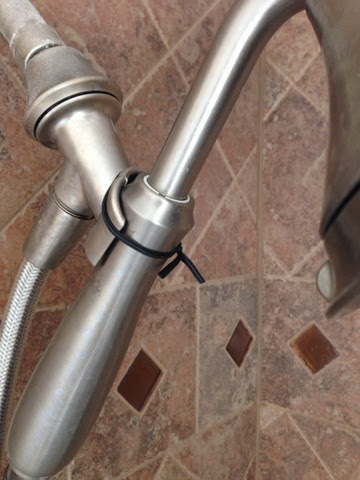 This keeps the tape from getting all bunched up when you screw on the new shower head. You need to go around the threads at least 2 full times. I went for 3 for good measure. 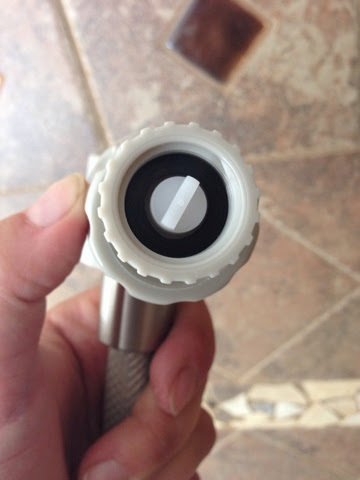 Make sure your new shower head comes with little gaskets (little black rubber rings). They help to prevent leaks. Screw it on, check for leaks, and you're done! This is the head I replaced in the master shower. Notice the bunched up teflon tape? It was put on in a counter-clockwise motion. Meet Duffy- our cat. He's a stray that was roaming our neighborhood in Dec. 2012. He came in "just until we found his owner." No one claimed him, and we were all relieved. 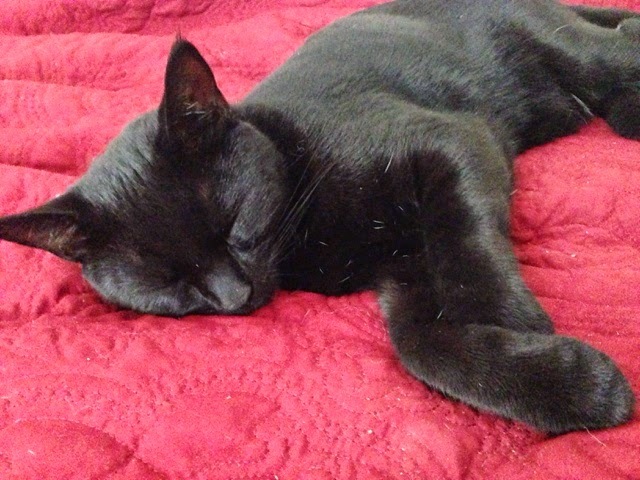 This cat is awesome and a permanent member of our family. Apparently I'm boring him with all my typing.